Graphically, the CBEP is determined at the point of intersection of total cash cost line and total sales line. 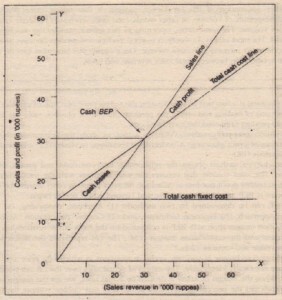 The area to the left of the curve signifies cash losses and the area on the right side is Indicative or cash profits. 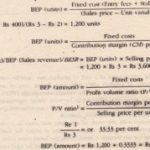 Assuming for the cash fixed cost to be Rs 15,000, the CBESR using Equation 8.27 would be Rs 30,000 = Rs 15,000 + 050. 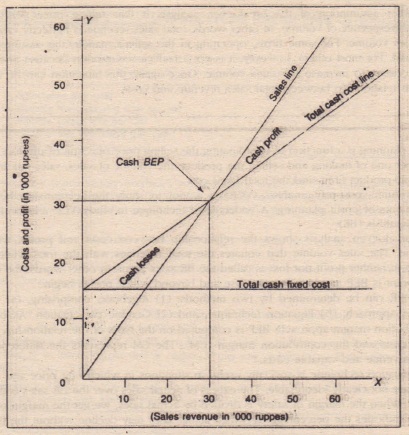 Portrays the graphic presentation of the cash break-even sales revenue. To conclude, the uses of break-even analysis, as a technique for profit planning, have been discussed in detail in this chapter. In brief, break-even analysis shows the interplay of profit factors that is, cost revenue and volume in a way which assists management in choosing the best feasible alternative now and in the future. The break-even system is at once an X·ray, exploratory and planning tool intended for frequent use and a proper cost-volume-profit analysis supported by the break-even chart can eliminate many of the time-consuming reports now being prepared at the company. The graphs can be used to analyse the impact of various alternative proposals under consideration on the profit structure. Thus, the break-even system provides more -readily understandable facts than conventional accounting or statistical data regarding the profit structure of the company. However, it is important to recognize its limitations which originate from the given assumptions. The greater the deviation of actual facts from the given assumptions, the more imperfect, incorrect and invalid are the break-even calculations. These limitations limit the usefulness of the break-even chart and must be borne in mind by those who prepare or interpret the break-even chart. These limitations suggest that the validity of the break-even chart in proportion to the validity of the assumptions. One of the assumptions of the break-even analysis is that an enterprises cost are either perfectly variable or absolutely fixed over all ranges of operating volume. In other words, variable cost is a linear function of volume fixed costs are assumed not to be affected by volume at all. In practice, these assumptions are not likely to be valid over all ranges of volume. Even within the relevant range of volume there is a likelihood of some degree of imprecision and to that extent validity of the results is affected. For instance, variable costs are likely to increase as the firm approaches full capacity. The reason may he due to less efficient labor or costly overtime having been resorted to. This limitation can be overcome by studying the relationship between total costs and volume non-linear to correspond with economic reality. Another assumption of the break-even analysis is that it is possible to classify total costs of an enterprise as either fixed or variable. Many costs defy clear division because they are partly fixed and partly variable. These costs are known as semi-variable costs. Yet another assumption of the break-even -analysis is that selling price per unit remains unchanged, irrespective of volume. In other words, total sales revenue is perfectly variable with its physical sales volume. For some firms, operating in the seller's market, this assumption may be perfectly valid. For most others. however, it is not a realistic assumption because price reductions may he necessary to increase the sales volume. Once again, this limitation can be remedied by studying the relationship between total sales revenue and costs.